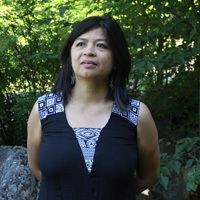 Merlyna Lim is a Canada Research Chair (CRC) in Digital Media and Global Network Society. An ALiGN Media Lab founder/director, Merlyna Lim’s research interests revolve around the mutual shaping of technology and society, and political culture of technology, especially digital media and information technology, in relation to issues of justice, democracy and civic/participatory engagement. Lim considers herself an interdisciplinary scholar and have published extensively in various disciplines, including communication and media studies, religious studies, journalism, urban studies/sociology, geography, anthropology, Asian studies, Middle East studies, information and library science, computer science and information systems. An award-winning scholar, in 2016, Lim was named a member of the Royal Society of Canada‘s New College of Scholars, Artists, and Scientists. Lim is the recipient of the Best Publication Award in Information Systems (2013). and selected “One of 100 Most Inspiring Indonesian Women” by the Kartini Foundation in 2011. Lim has been awarded dozens of research grants/awards from various institutions such as Canada Research Chairs, Social Science and Humanities Research Council (Canada), Canada Foundation for Innovation, the Ontario Research Fund, the National Science Foundation (United States), the Ford Foundation, the Volkswagen Foundation, the East-West Center, the Open Society, and the Royal Netherlands Academy of Arts and Sciences (KNAW). Lim, M., 2018. Challenging Technological Utopianism. Canadian Journal of Communication, 43(3). Mitchell, S.S.D. & Lim, M. 2018. Too Crowded for Crowdsourced Journalism: Reddit and Citizen Participation in the Syrian Crisis. Canadian Journal of Communication, 43(3): 399-419. [PDF]. Yuce, S., Agarwal, N., Lim, M., Robinson, R.S., Wigand, R. 2015. Bridging Women Rights Networks: Analyzing Interconnected Online Collective Actions. Journal of Global Information Management, 22(4): 1–20. Agarwal, N., Lim, M., Wigand, R. 2012. Raising and Rising Voices: A Novel Methodological Approach in Studying Cyber–Collective Movements, Business & Information Systems Engineering, 3: 113–126.